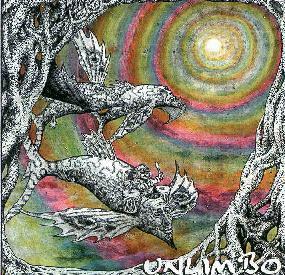 Unlike the Delerium lot, Unlimbo is a 'free-festy' style psychedelic band that stayed the course and have not dived full-bore into electronica mode. I guess that's why they haven't been signed on to Delerium, instead releasing this third effort (following a 3-track EP and a 9-track live CD... could they be Poly #01 and #02?) on (I'm guessing) their own independent label. That said, the seven-member unit does claim multiple hands on synths, samples, decks, and various forms of percussion. But "Drum & Bass" doesn't come to mind. Rather, from the very opening of "Nahton," the words "Ozric" & "Tentacle" are conjured up instead. Circa 1990 Ozrics, that is. Prahna Fish's seven tracks add up to almost 50 minutes, and so Unlimbo likes to play around with each idea for about 6-8 minutes or so, relying on the usual smattering of reggae/dub rhythms and eastern flavors. In lieu of any 'lyrical' vocals, the band employ lots of spoken-word voice samples from numerous sources (Captain Kirk and Bones make an appearance), including more than a few drug-related passages. For example, in the midst of the wonderfully dreamy title track, we hear "You don't have to do anything now but hallucinate... I'll come back for you later." Shortly thereafter, Gundula Grun's violin and Chris Muggeridge's synths dance amongst themselves over an active bassline and punctuated beat, the resemblance to Hawkwind's Palace Springs almost too uncanny. "Spellbound" is one of the more evolved tracks, practically a medley of many different themes with shifting focus (guitar to bass to synth) presented at intervals of thirty seconds or so. Very nice. The album finishes off with "Inertia," yet another eight-minute space-reggae tune that recalls any Ozrics or Dead Flowers tune you care to mention... but at least it's a good one. Unlimbo does have a few of their own tricks up their collective sleeves. Early in the album, "Flinch" is only classifiable as a 'hoedown dub,' Grun's violin more aptly termed 'fiddle.' And then the reggae stylings of "Bagdub" are less like the Ozrics' version than the Police's take on things. A much freakier version of the Police, no doubt, and a nice guitar solo to boot. 'Prahna Fish' hardly treads upon virgin ground, but yet I still feel it deserves high praise. The Ozrics spawned a whole slew of copy-cats, some of which turned out to be superior to this listener's ears (the aforementioned Dead Flowers and Ship of Fools, for example). David Hands' guitar work is notably less prevalent than Ed Wynne's contribution to any given OT disc, but the clever use of sampled voices, lots of extra-spacey synths, and violin and didgeridoo fill any suspected void quite satisfactorily. I can't predict how long Unlimbo can stay 'relevant' in the neo-psychedelic world in this guise, but given their strong musicianship, capable song-writing, and high freakiness factor, future albums aren't likely to be stinkers at least. You can visit Unlimbo at their web site.